Both tennis elbow (also known as lateral epicondylitis) and golfers’ elbow (medial epicondylitis) are conditions that cause pain in the elbow – either on the outer side (tennis elbow), or on the inner side (golfers’ elbow). Both are overuse conditions – the daily use causes more damage to the tendon than the body can repair. The result is microtearing in the tendon. 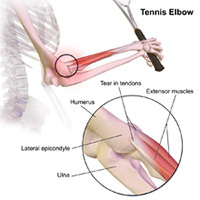 In tennis elbow this affects the tendons that extend the wrist and fingers, particularly the so-called ECRB tendon. These tendons are attached to the prominent bone on the outer side of the elbow. The ECRB tendon is located in a deeper layer, seems to get less blood supply and is more prone to mechanical irritation when it moves over the bone. Golfers elbow affects the tendons responsible for bending the wrist and rotating the forearm. These tendons originate from the prominent bone on the inner side of the elbow. In the past it was felt that tis is an inflammatory condition, but the changes seen in the diseased tendon under the microscope point towards overuse and repetitive strain as the main problem. Is this caused by my job? Many factors can influence the onset of tennis/golfer’s elbow. Typically, this is a middle-aged problem, but occupation and hobbies can be major contributing factors. Repetitive and/or manual jobs are more likely to be causative than less strenuous jobs. 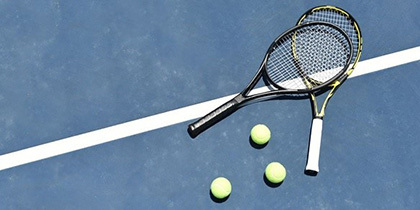 Particularly racquet sports like tennis are a risk factor. Pain usually develops gradually and typically without any apparent injury. Patients often complain of activity related pain, pain when gripping, often a dull ache or a burning pain and a feeling of weakness. Any gripping activities like carrying a shopping bag can aggravate the pain. The doctor will take a detailed history to find out about the nature of your symptoms, how they started and which activities aggravate the pain. How do the symptoms impact on work, sporting activities and hobbies? Have you already had any treatment and if so, how did you respond? The doctor will then examine the elbow. This will include some special resistance tests. MRI: this is useful to look at the soft tissues in and around the elbow. If the diagnosis is not clear, a MRI scan can show typical abnormalities in the tendon to support a diagnosis of tennis/golfers elbow. A scan can also show abnormal synovial folds in the elbow that can mimic tennis elbow. Sometimes a scan of the neck might be required if there is a suspicion that your symptoms might be related to nerve entrapment in the neck as a result of a slipped disc. Nerve conduction/EMG studies: These tests are occasionally requested if there is a suspicion, that an entrapped nerve next to the elbow causes the symptoms. My symptoms have been going on for a long time. Do I need surgery? Rest, activity modification and pain avoidance: Since the condition is caused by overuse and repetitive strain, it makes sense to reduce the load on the affected elbow. This gives the body’s own repair mechanisms an opportunity, to heal the problem. This is a slow process that can take many months during which the pain should slowly improve. Equipment check: If you play tennis, squash of badminton, it’s worthwhile checking your racquet. Size and stiffness of the racquet as well as tension of the strings can influence the levels of vibrations and loads acting on your forearm and elbow. Tennis/golfer’s elbow braces: The brace is applied just about an inch below the elbow and applies light pressure on the muscle. This is supposed to offload the damaged tendon. Braces rarely cure the problem overnight but typically lead to a degree of pain reduction that enables patients to get on with their life in more comfort. 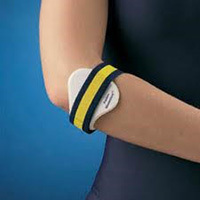 Physiotherapy: This will include a range of eccentric strengthening and stretching exercises. Sometimes local treatments like ice, heat, deep friction techniques, acupuncture, ultrasound or electrotherapy can be beneficial. Physiotherapy supports the natural healing processes and therefore takes time to work. Steroid/cortisone injections: These injections often help reducing pain levels within a week or two. But since the injection doesn’t cure the underlying problem, the pain often comes back within 2-3 months, often with a vengeance. Particularly repeated injections can result in a poor long-term outcome and therefore the use of steroid injections should be carefully considered and discussed. Hyaluronic acid injections: This agent is made of concentrated lubricants and is typically used in the treatment of painful arthritis. There is some recent research to support its use in patients with tennis/golfers’ elbow. This still has to be considered as a somewhat experimental treatment. 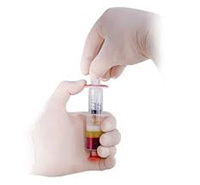 PRP injections: Platelet rich plasma (PRP) is a recent and promising treatment that is supposed to stimulate and support the body’s own natural healing response by injecting concentrated growth factors obtained from the patient’s own blood into the affected area. Recent research has shown promising outcomes, but the treatment takes time to kick in. Sometimes a repeat injection might be required. More research is required to evaluate the true benefits of PRP injections. Extracorporeal shock wave therapy (ESWT): This sends shockwaves through the tissues and is supposed to activate the natural healing mechanisms. EWST has seen a surge in popularity a few years ago, but doubts remain over its efficiency. Surgery is reserved for treatment-resistant patients who failed lengthy non-operative treatment. As part of the procedure the surgeon will remove unhealthy parts of the tendon and carry out a release of the tendon. This is then followed by a lengthy rehab process. Keep in mind, that surgery for tennis/golfer’s elbow carries a risk of complications just like any other surgery and the indication for surgery should therefore only be made after careful consideration. Complications can include: infection, damage to nerves/vessels, loss of strength, prolonged rehabilitation and rarely the need for further surgery. Physiotherapy following surgery is essential to support the rehab process. To help making surgery a success, patients usually have to refrain from strenuous activity and heavy manual work for 6-12 weeks. Is surgery a guaranteed cure? One year after surgery, about 80-90% of patients are much improved. It often takes a few weeks for the acute pain to settle and the rehab process can take 3-6 months. While most patients are happy with the outcome, some may have persistent niggles or a subtle loss of strength. It is best to discuss the potential risks and benefits as well as the rehab implications in detail with your surgeon.